1955: William Henry Gates III is born to attorney William Henry Gates II and Mary Gates, a schoolteacher, University of Washington regent and chairwoman of United Way International. He is raised in Seattle. 1967: Gates is enrolled in the Lakeside School, an exclusive private school in Seattle, where he befriends Paul Allen. The two students share an interest in computers and programming. The school notices his knack for technology and asks him to create a computerized schedule of classes.Gates’ 2005 keynote speech at Lakeside School. 1975: From his dorm room, Gates calls MITS, the maker of the world’s first personal computer. He offers to develop software for the MITS Altair. MITS eventually accepts and buys his language for $3,000 plus royalties. Gates takes his first leave of absence from school to start working on the software venture he refers to as Micro-Soft. 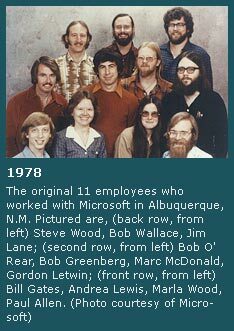 1977: Gates takes a second leave of absence from Harvard and sets up Microsoft in Albuquerque, N.M., where MITS is headquartered. 1978: Microsoft’s year-end sales exceed $1 million. Gates gains a reputation for being tough, but focused. 1981: Microsoft incorporates and buys the rights to the operating system “DOS” from Seattle Computer Products. The system is modified and renamed MS-DOS, and the company licenses it to IBM for the company’s new personal computer. 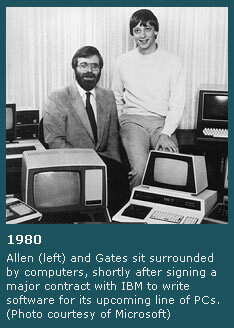 1983: Allen leaves Microsoft after developing Hodgkin’s disease. Microsoft announces Windows as an extension of its MS-DOS operating system. 1986: Microsoft headquarters move again, this time to nearby Redmond, Wash. Shortly after, the company goes public. 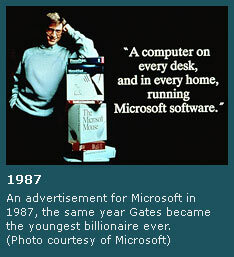 1987: At age 31, Gates becomes the youngest billionaire ever. He meets his future wife, Melinda French, at a Microsoft event in New York. 1989: Gates founds Corbis, an archive of art and photography from public and private collections. Corbis later becomes one of the largest collections of visual information in the world. 1990: The Federal Trade Commission begins an investigation into possible collusion between IBM and Microsoft.The FTC charges that IBM and Microsoft collaborated to divvy up the market for operating systems in an anticompetitive way, with IBM’s OS/2 capturing the high-end of the market and Microsoft’s Windows covering the low-end of the market. 1994: Gates weds French; the couple goes on to have three children. 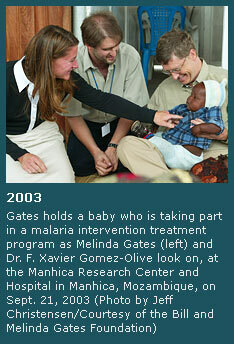 The Gateses consolidate their charitable giving under the William H. Gates Foundation, named for Gates’ father, who agrees to manage the foundation. It is later absorbed into the Bill & Melinda Gates Foundation. 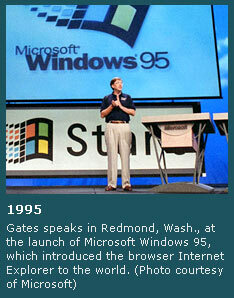 1995: In July, at age 39 and with a fortune of $12.9 billion, Gates becomes the world’s richest man. Later that summer, Microsoft introduces Internet Explorer to the world, as part of Windows 95. The Road Ahead, Gates’ book about his vision for the digital future, holds the No. 1 spot on The New York Times best-seller list for seven weeks. Gates begins to shift Microsoft’s focus toward the emerging Internet. 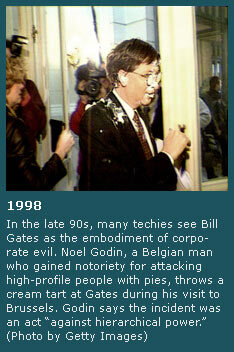 1998: In Belgium, on his way to meet business and government leaders, Gates is hit in the face with a cream pie. The incident was orchestrated by Noel Godin, a Belgian who gained notoriety for throwing pies at high-profile individuals. Godin was quoted saying the incident was an act “against hierarchical power.” In May, the U.S. Justice Department charges Microsoft with engaging in anticompetitive and exclusionary practices designed to maintain its monopoly in personal computer operating systems and to extend that monopoly to Internet browsing software. Twenty state attorneys general and the District of Columbia filed a similar action. Later, in October the DOJ also sued Microsoft for violating a 1994 consent decree, by forcing computer makers to include its Internet browser as a part of the installation of Windows software. 1999: Gates publishes another best-selling book, Business @ the Speed of Thought, about the interconnectedness of business and technology. That year he begins appearing more and more in pop culture. The television network TNT airs a made-for-TV movie about the emergence of Apple and Microsoft called Pirates of Silicon Valley. Anthony Michael Hall, who played the nerd Brian in The Breakfast Club, plays Gates. 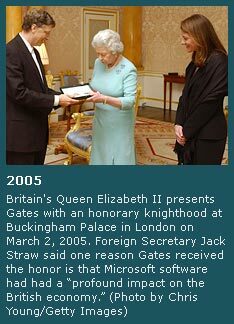 2005: Queen Elizabeth II bestows an honorary knighthood on Gates for his contributions to the United Kingdom. Time names him a “Person of the Year,” along with Melinda Gates and Bono, for what the magazine called his “good Samaritan” work. More. 2006: Gates announces that his role as an executive at Microsoft will be phased out over the following two years. His intention, he says, is to spend more time working with The Bill & Melinda Gates Foundation. Shortly after his announcement, Warren Buffet donates $31 billion, most of his fortune, to the foundation. More. 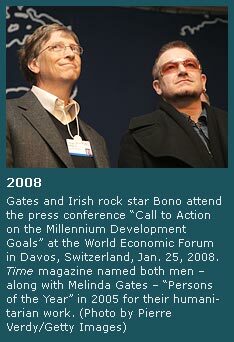 2008: Though his fortune continues to grow, Gates loses his spot as the richest man on the planet. After 13 years in the No. 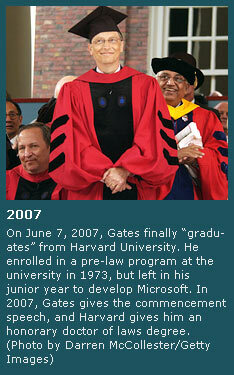 1 spot on the Forbes’ list, Gates’ is surpassed by his friend Warren Buffet and Mexican telecom giant Carlos Slim Helu. Gates retires from day-to-day duties at Microsoft on June 27, but stays in the role of chairman and adviser on important development projects. He tells the Seattle Post-Intelligencer that he plans to pour the same amount of energy into his foundation that he did into Microsoft. He tells the newspaper, “I’m not a sit-on-the-beach type.” Gates’ retirement video.